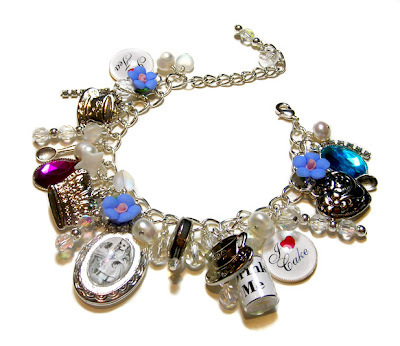 Yes, even more Alice in Wonderland themed bracelets, they are becoming so popular and I love creating them. The charms are so gorgeous that they make every individual piece a pleasure to work on. This particular design uses a gorgeous Alice silver tone locket, little charms saying "I love cake", silver toned tea pots, a silver queen of hearts crown, blue pot/clay flowers and even a little bottle with a note inside saying "drink me". All the well known references from the classic story are captured so beautifully in these charms. I just love making them. Think the Alice jewellery is great love the way you've used the charms, great stuff!